From famine to feast. 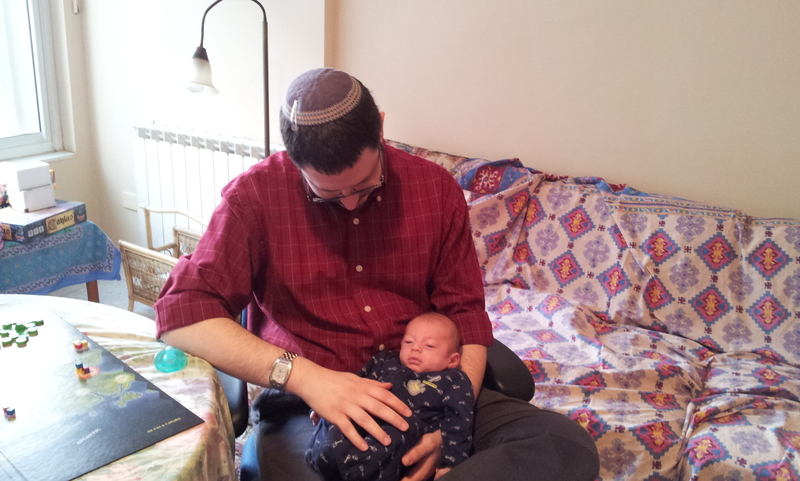 Binyamin came for the first time; he has wanted to come for a while but wasn’t able to. He also brought his friend Nissan, who lives pretty close and also should have come sooner. 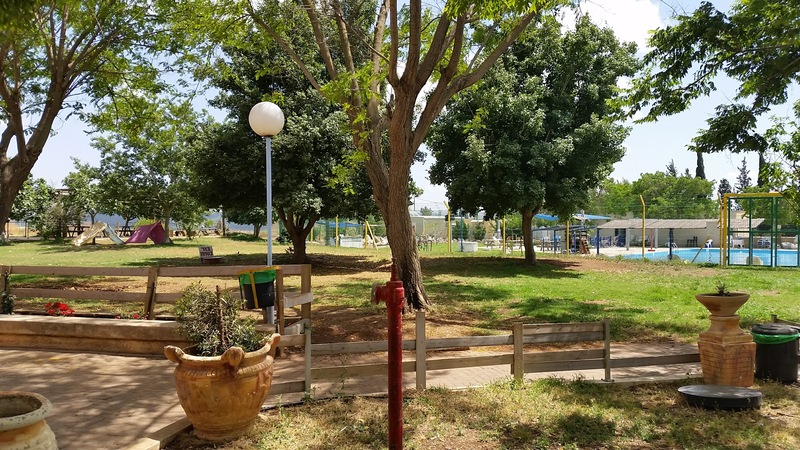 🙂 Gili brought two nephews, Omri and Shaul. 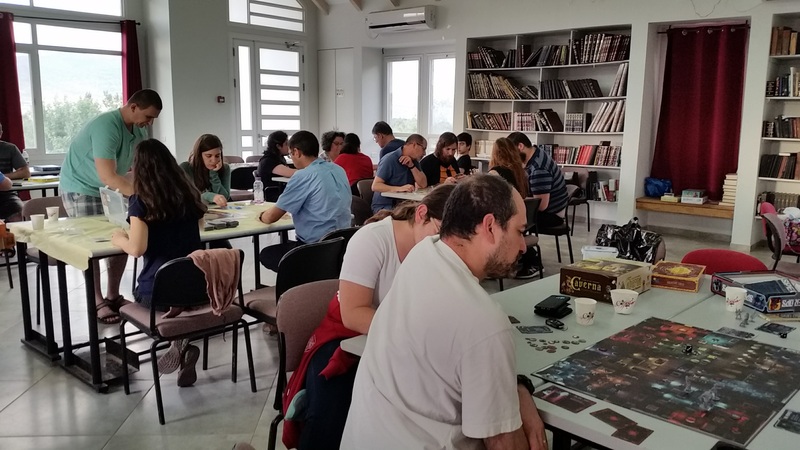 All of the new people were experienced players, more or less. 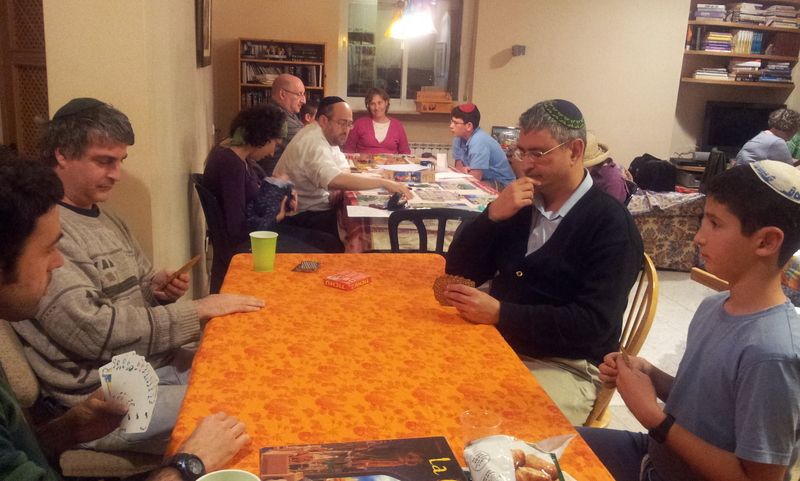 We waited for a few of the participants to come after maariv. Score: 16. First play for everyone except for Gili and me. We managed to play without too many information slips. It was still a fun game, far more for the tense moments of doing the wrong or right thing, often by accident, than for the end result. We killed the 2s in two colors fairly quickly, but we made it up to 5 in one color and then 4 and 5 in two other colors with 1 life left. Yay us. 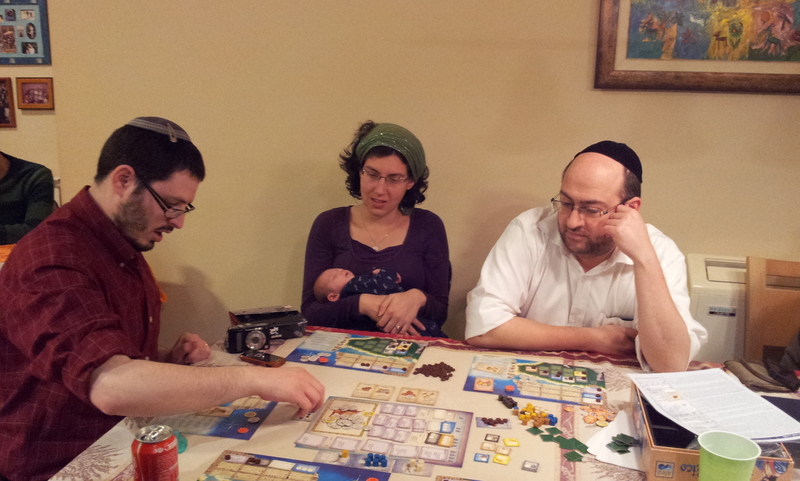 First play for everyone except me, Binyamin (who brought the game) and Gili (who had played once or twice). First play with 7 players for all of us I think (I’ve played with 6), which is a little odd since the cards never make it back to you. 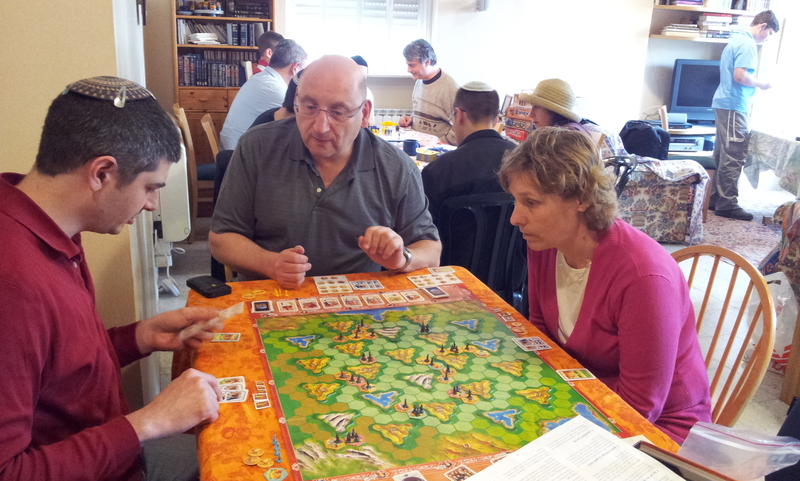 Everyone seemed to enjoy it, and it played fairly smoothly even with 7. Nissan won with strong military as well as decent blue and purple. I thought I was doing well with my blue (I thought green would be impossible with 7 players) and my wonder but that wasn’t enough. I played with very few resources but yellow cards that let me buy them cheaply. 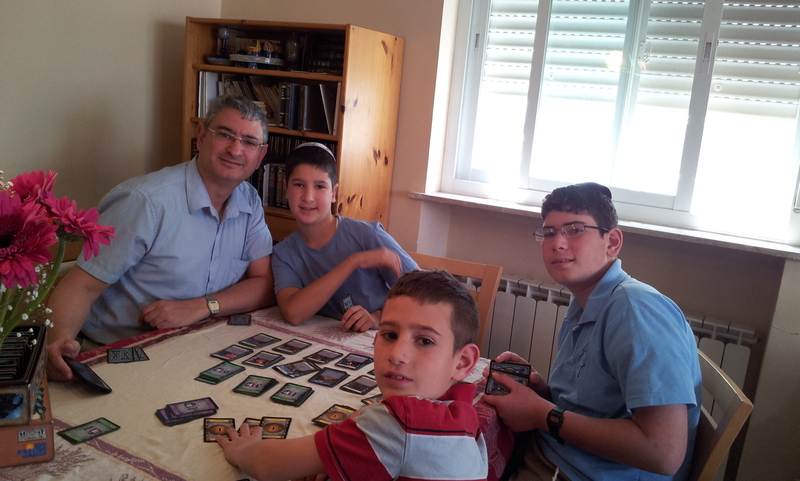 Omri’s second place was earned with military and decent showings with his wonder, blue and green (4 of a kind). 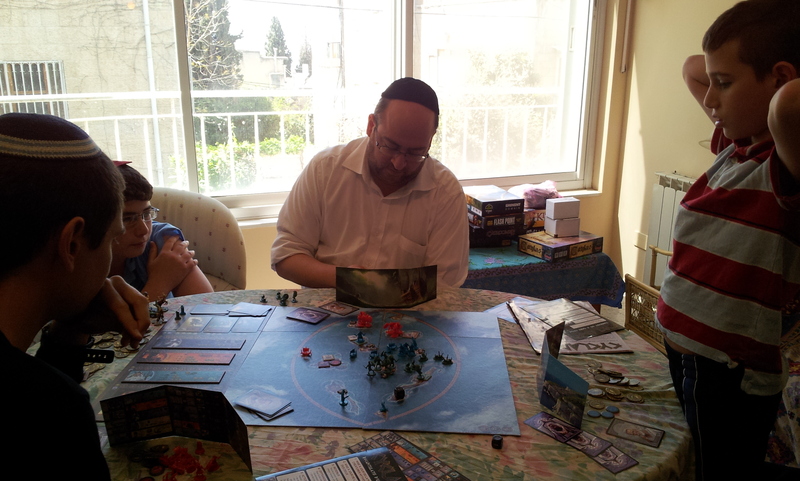 Binyamin had tons of resources and was hoping to make up the point differential on the last age, but it wasn’t enough. First play for everyone except for Gili, who had played once a long time ago. I had them play with my rule tweak that has the curse only kill the next disk in line for a treasure card, instead of the entire treasure (which swings the game too much). Everyone seemed to enjoy this one, too. 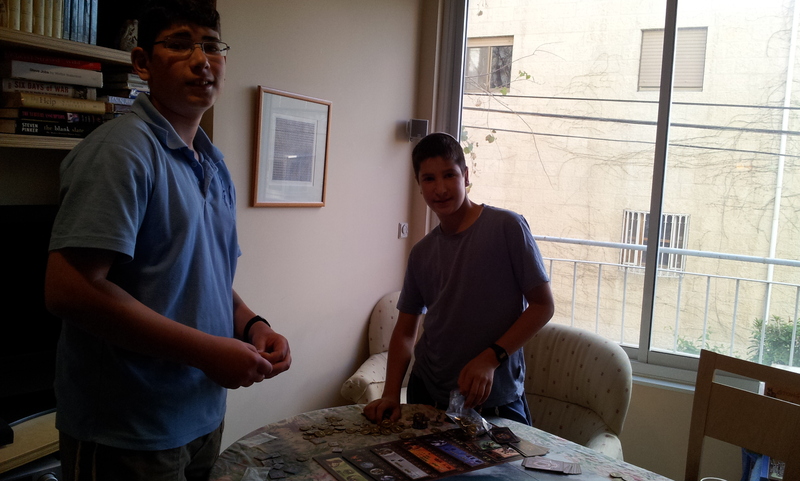 First play for Binyamin, second for Aaron. 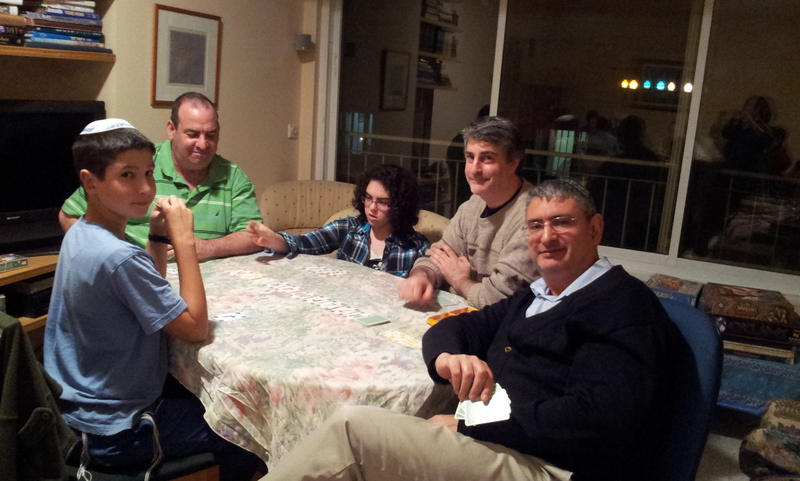 They didn’t do much of a job teaching Binyamin how to play while I was teaching the others how to play Tobago, so the first few hands were a series of rules surprises for Binaymin. He still caught on quickly. 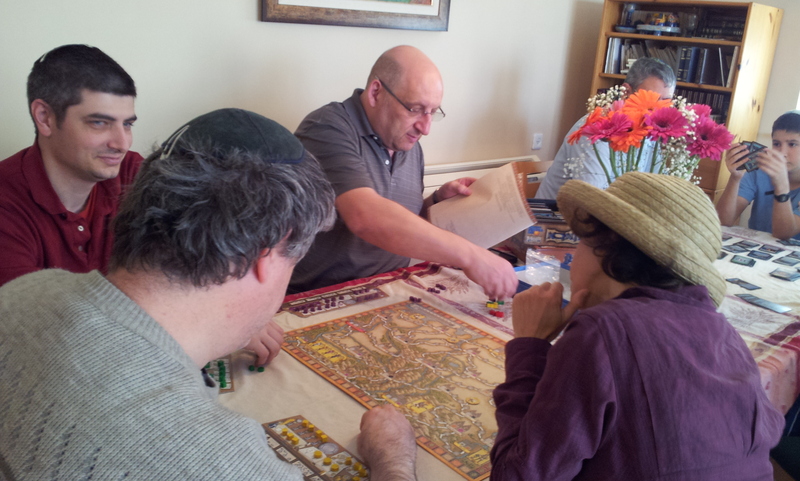 We started with a 200 point jump, then Aaron/Tal made two Tichu’s +80 points on each. 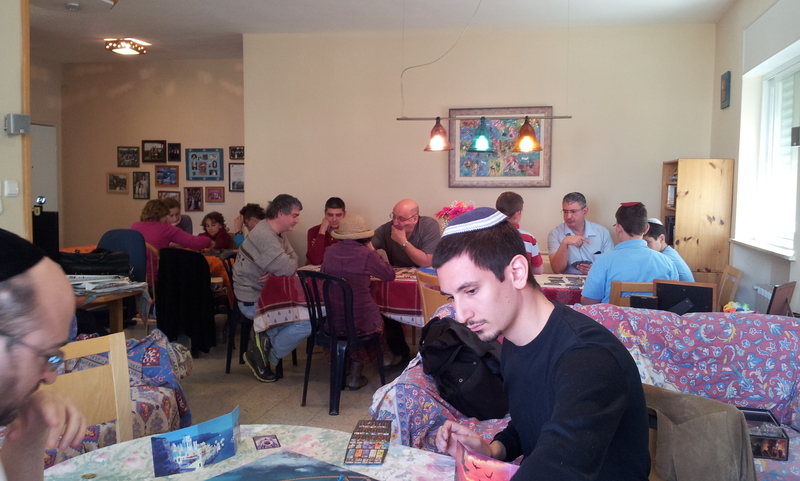 We pulled ahead again, and then Binyamin lost a Tichu when Aaron got in and played two full houses and then went out. Then I called Grand Tichu and Aaron did the exact same thing again. After that we were still only down 200 points or so. On the last hand, down about 210 points, I called Grand Tichu again and made it + at least half the points. I think we ended up slightly ahead, but we didn’t count thoroughly so we might have actually tied. 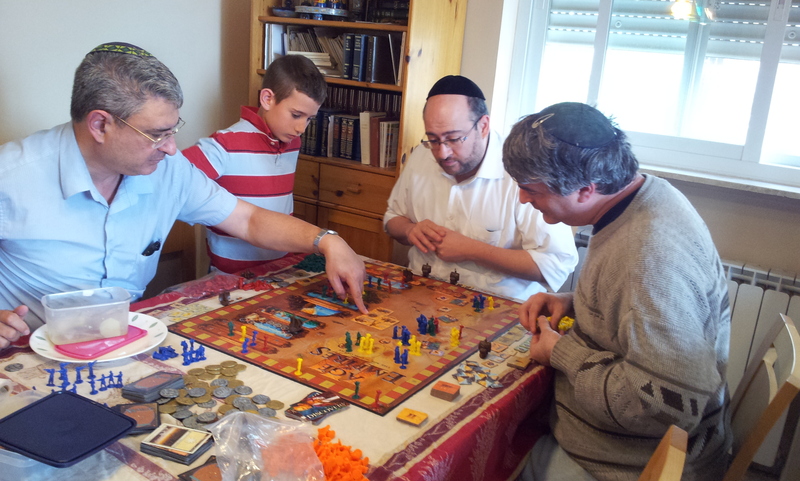 Anyhoo, Aaron continues to love the game and I think Binyamin has been converted. 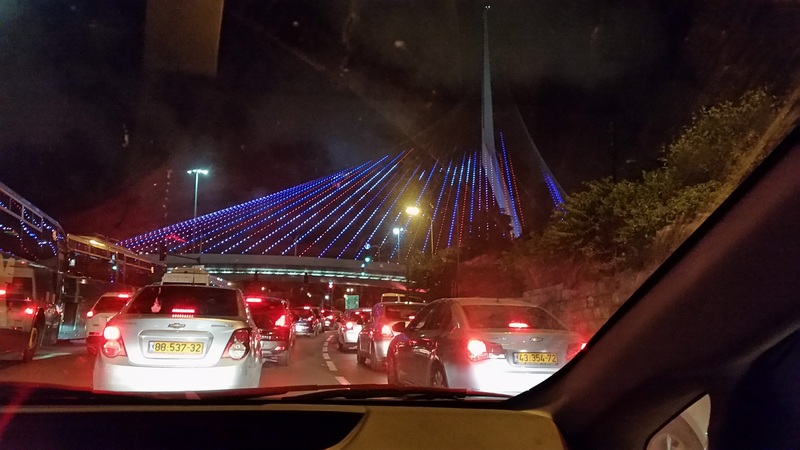 Leastwise, Binyamin and Nissan promised to come again. Hopefully Omri and Shaul will, too. Or bad luck. We managed to scrape together 3 players for a game, everyone else seems to have disappeared. Mace is in Australia. 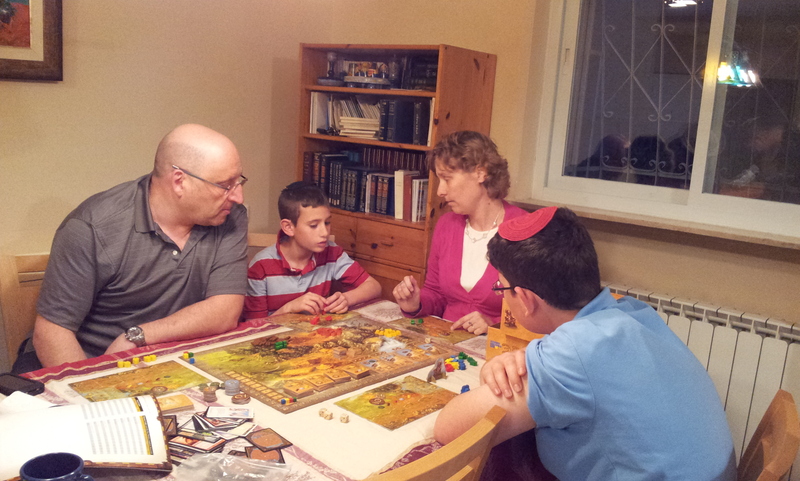 Gili wanted to play this, first play for Eszter who had been considering buying it, and liked it. 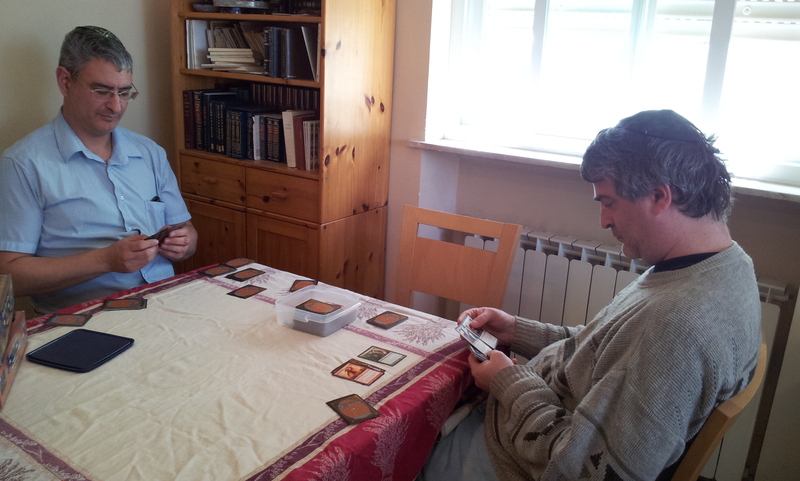 Gili wanted to play with the curse cards, when Jon plays we usually take them out. So she asked for the bad luck in a way. Gili got the first treasure, and was in a good position to get lots of victory cards from it. But the first card turned up was a curse, and no one had amulets yet. I followed my usual strategy of focusing on amulets over driving around to get treasures, though I did get one that was close by, with the help of two amulets and Gili’s suggestions. I got a lot of cards with that treasure, including a six, so I started off ahead. 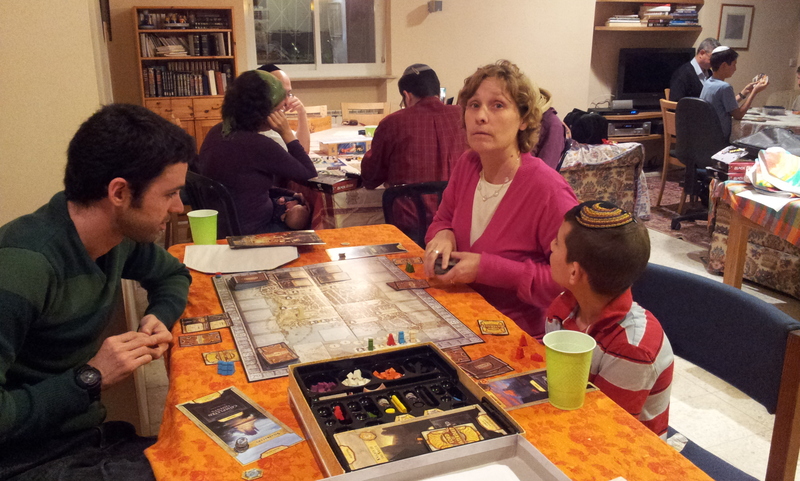 Eszter ended the game with around 8 amulets, she kept saying they wouldn’t help her, she used one or two. I used my third and last amulet to trade in all my cards because I wanted to end a long color which would give me at least 4 cards. I got 5, and Eszter got 5, finishing the deck so we knew there was a curse in it, but it didn’t show up til we got all our cards. 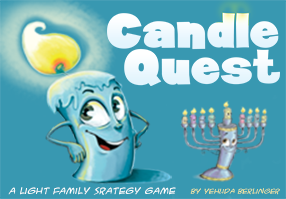 It’s a fun game except for the luck, which is there even without curses. We didn’t meet last week, the week before Gili and Eszter played Atlantis. Wednesday morning Jon left early and volunteered at registration, and saved spaces in line for Bill and Shirley but not for me, we were in different lines alphabetically. We didn’t get there until close to 10, which I thought was late. I talked to people I was in line with, very representative of the participants – computer programmers from Texas. I said that I was surprised that the line wasn’t moving, they told me it doesn’t open til 10. So we got there at the right time, it went pretty quickly, all very organized. You pick a free game or two upon registering, I took Highland Clans and Train of Thought, I’m not familiar with either of them. I had read about a new game, introduced at the recent huge Essen game con in Germany, Walnut Grove, which I was thinking of buying it and wanted to try it out. All day Wednesday and Thursday, whenever I went by it in the Hot Games room, which has Essen games set up, either a game was already in progress or there was no one there. I not only needed players, but someone to teach it. I walked around looking at games, and ended up joining one in the large main game room, K2. 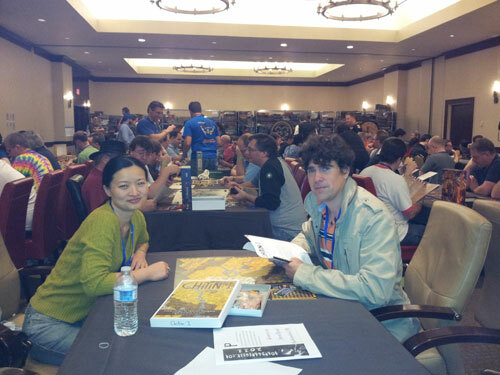 One of the people playing was Mischa, a friend of Jon’s who runs the bgg math trade. I had traded one game but wasn’t going to be able to attend the official trade time on Saturday, so I had emailed the person I needed to give my game to, and the person who was giving me a game. The backup plan was to leave the game with Mischa. K2 has a simple structure with deeper strategy than it appears.You expend points for climbing and oxygen, selected from cards you pick. I didn’t understand certain things right away, so I was behind most of the game. The other woman player was doing really well, she got both of her climbers to the very top, and down again alive, without even pitching a tent which reduces oxygen required. We were playing on the easy side of the board, with only summer weather, but it was still challenging. At the end, two players weren’t able to prevent either one or both of their climbers from dying, which results in a complete loss of points, so I came in second. I went back into the Hot Games room and sat down by Walnut Grove, but no players came, and I was hungry, so I found the others and we took a break for lunch. 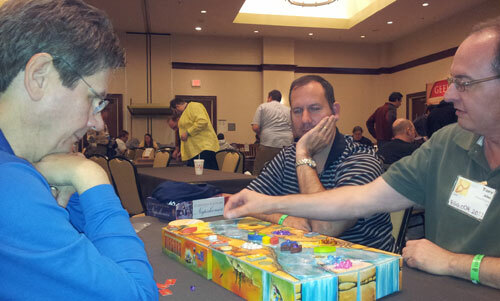 I tried again after lunch, but switched to a game nearby which was starting, First Sparks, by the creator of Power Grid. 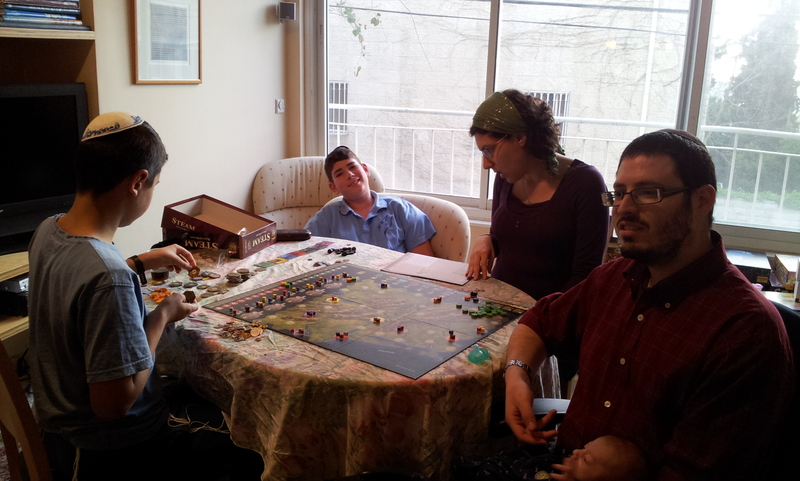 The game is similar to Power Grid which helped us figure out how to play, and someone came over to teach it. 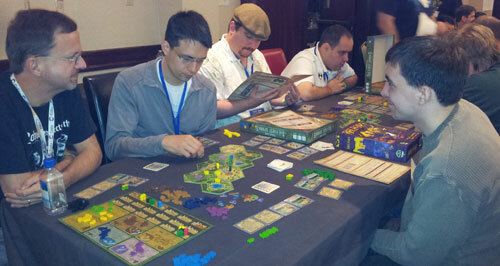 One person hadn’t played Power Grid so we gave him some tips. It has a cave man theme and is simpler than Power Grid. The card structure is similar, but you place cavemen competitively for end game points. We found out near the end of the game, because someone overheard us, that one of the changes from Power Grid is that you don’t bid for cards, rather you have right of refusal in turn order, so you never pay more than the amount on the card. We hadn’t had much competitive bidding, so it wouldn’t have made a big difference in the game, the card movement and availability are the same. I tied to win and had 3 vs. 1 food left to win the tiebreaker. I want to get this game because it’s good with attractive graphics, and I don’t have Power Grid. The store at the con finally got it from the airport on Friday, but it will be available for less at other stores, hopefully in time for Bill and Shirley to bring it. Then I played Coney Island in the large room. I had this on my wishlist at one point, but couldn’t remember if I had taken it off or not. After playing, I was really hoping that I wouldn’t receive it as my Secret Santa gift. No one liked it, there are so many better games. We all helped each other as we tried to figure out the game. At one point, they recommended that I make a different move, where if I got a red tile instead of white tile in a random draw, I would get 9 points. It worked, which helped me, though I was still behind. I did start to understand the game by the end, by which time things were mostly already placed. I did what I could, and somehow ended up winning by one point. 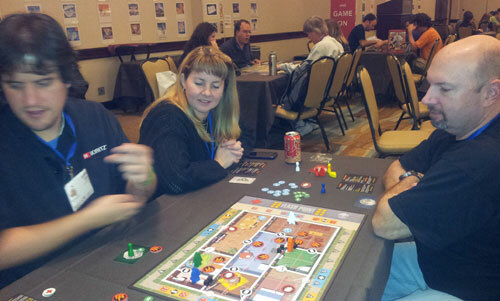 Then I joined a firefighting game, Flash Point, an Essen game but in the main room. I didn’t realize it was cooperative, but it was interesting. We were playing with intro rules which meant no firetrucks and hoses, which must make it more interesting. I was fighting fires, everyone else was rescuing people. The game actions cause explosions and destruction. We ended up losing, the house collapsed before we could rescue everyone. But I was the only one who didn’t die because I happened to be outside the house. We had bad luck with the people, the first two tokens were blank rather than victims. It’s a good game because there’s a lot of fast action and some planning. 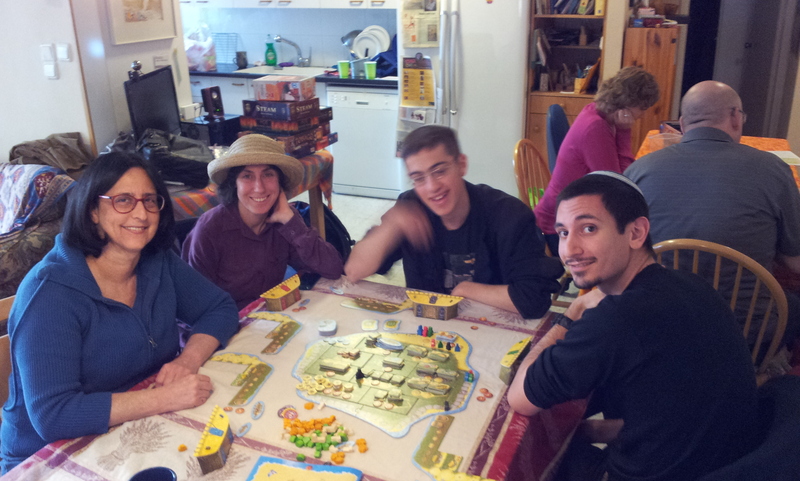 Jon came with me to try to get a game of Walnut Grove going. Scott Nicholson of Board Games with Scott walked by, he didn’t want to play but gave us a quick rules explanation. 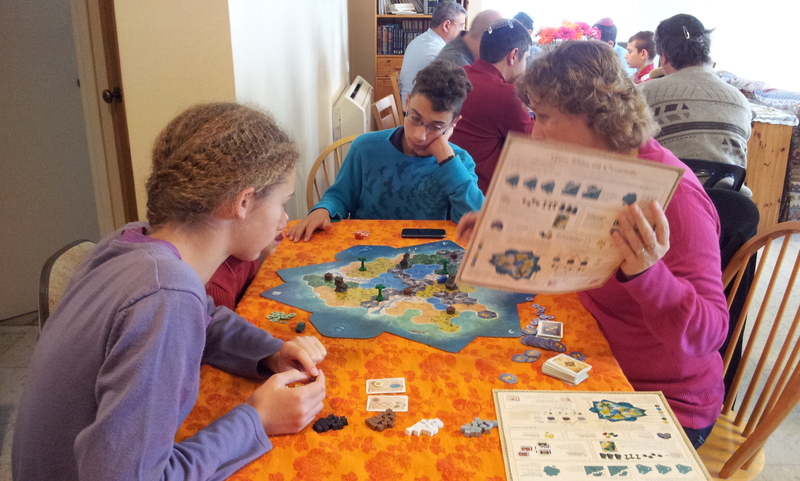 More players didn’t join, and Jon decided he was too tired to play a new game. We walked around a bit, Jon agreed to teach Tobago, and I saw a game of Niagara which I had heard of because one year I gave one of my Secret Santa targets a Niagara exapansion. 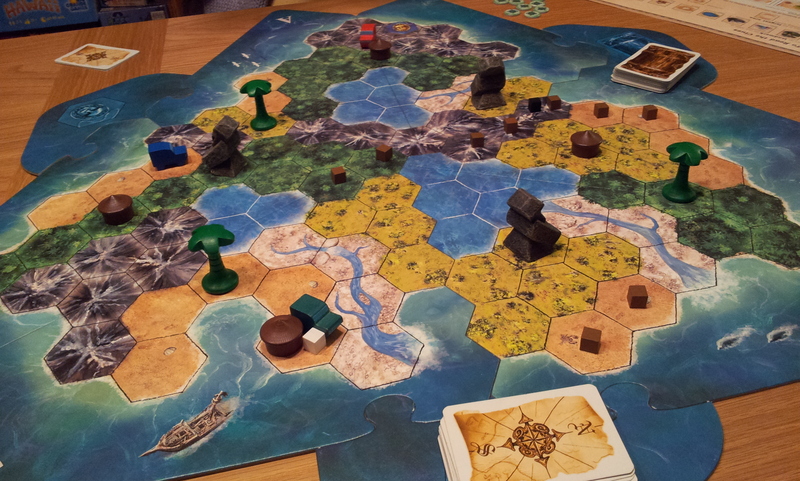 Jon ended up playing Tobago, so I went back to join Niagara. It’s a good game, simple and cute mechanics, you physically move plastic discs in the river which push your canoes around and over the edge sometimes. It’s very difficult, an experienced player won. They played again but I left. It was freezing cold on Wednesday, we didn’t have all our warm clothes with us because it had been so warm the day before. The rest of the week it warmed up with sun and some clouds, but we were mainly indoors. Bill and Shirley played the redesigned Chitin: I, which Bill had a copy of when he was in high school.